Every few years, with soothing regularity, a prominent research institution comes along to recommend that the United States reengage with Iran. The gist of such reports usually follows the same line: Isolation just isn't working; reformists (or sometimes they're called moderates or pragmatists) need Washington's help in the battle against hard-liners; the country is not (nor will it ever be) on the verge of a new revolution; and only relations with the U.S. will provide incentives for better behavior. This week, it was the Council on Foreign Relations that sounded the call in a 79-page report from a task force chaired by former national security advisor Zbigniew Brzezinski and former CIA Director Robert M. Gates. Given the seriousness of the threat Iran poses, fresh ideas from the Council on Foreign Relations and elsewhere are, of course, welcome. Iran, after all, is Terror Central: It has become an operational headquarters for parts of Al Qaeda, continues to sponsor Hezbollah and Hamas, and senior officials remain under indictment in U.S. court for masterminding the 1996 bombing in Saudi Arabia of the Khobar Towers military housing complex, in which 19 Americans died. According to U.S. and European officials, the regime also remains bent on acquiring nuclear weapons and is well down the road to doing so. Clearly, U.S. policy in Iran has been a failure. Its problems have persisted notwithstanding four years of tough talk from the Bush administration, a continued embargo on U.S. investment and virtual diplomatic radio silence. It's time to try something new; on that much, we can agree with the pro-engagement groups. But that's where our agreement ends. They insist, in the face of evidence to the contrary, that dialogue and trade would succeed where a hard line has failed. Yet dialogue and trade are the hallmarks of Europe's fruitless engagement of Iran. Neither European diplomatic outreach nor cordial trading relations have achieved results. Carrot-and-stick offers, like a proffered "trade and cooperation agreement" in exchange for a stand-down on nuclear proliferation, have also failed. Engagement is a proven bust. The fact is, neither tough love nor tough talk will achieve results in Iran because decision-makers in the government--not just the so-called hard-liners but the "moderates" and "pragmatists" as well--are committed to supporting terrorism, developing nuclear weapons and annihilating Israel. Any opening from the U.S. will only lend credibility to that government and forever dash the hopes of a population that, according to reliable polls, despises its own leadership. So what to do? President Bush has taken the first step by making clear that the Iranian clerical regime is anathema to the U.S. national security. But we're not likely to invade for a variety of practical reasons, among them a shortage of troops and an absence of targeting information about Iran's nuclear sites. Nor can we count on Iran's weary and miserable population to rise up unaided and overthrow its oppressors; virtually all analysts agree that's not about to happen. Instead, a new three-part policy is needed. First, the administration must ante up promised support for the Iranian people. Just as we supported Soviet dissidents, we must use the diplomatic and economic tools at our disposal to embarrass the regime for its abysmal human rights abuses, rally behind dissident student groups and unions and let them know that the U.S. supports their desire for a secular democratic state in Iran. Second, the administration must persuade the European Union and the International Atomic Energy Agency to stand firm in their confrontation over Iran's nuclear program. Iran has made commitments to end the production and assembly of nuclear centrifuges. It has reneged on those promises, and the next step is for the IAEA to refer the matter to the U.N. Security Council. There is quiet talk of economic sanctions in European capitals; the EU must know that a failure to follow through would mean an Iranian nuclear weapon within a few years. Finally, the U.S. must lead in the containment of Iran. Iranian weapons imports and exports should be interdicted; financial transfers to terrorists must be identified and confiscated; terrorists traveling into and out of Iran should be aggressively pursued and eliminated. These steps would not deliver quick solutions, but they are the only rational course available to the U.S. and its allies. We have seen that engagement with the current leadership of Iran would not achieve policy change; all it would do is buy an evil regime the time it needs to perfect its nuclear weapons and to build a network of terrorists to deliver them. Danielle Pletka is vice president for foreign and defense policy studies at the American Enterprise Institute. THE US will mount a concerted attempt to overturn the regime in Iran if President Bush is elected for a second term. It would work strenuously to foment a revolt against the ruling theocracy by Iran's 'hugely dissatisfied' population, a senior official has told The Times. The United States would not use military force, as in Iraq, but if "Bush is re-elected there will be much more intervention in the internal affairs of Iran", declared the official, who is determined that there should be no let-up in the Administration's War on Terror. To what extent the official, known to be hawkish, was speaking for the White House was unclear, but his remarks are nevertheless likely to cause alarm in Europe. He hinted at a possible military strike against Iran's nuclear facilities, saying that there was a window of opportunity for destroying Iran's main nuclear complex at Bushehr next year that would close if Russia delivered crucial fuel rods. To destroy Bushehr after the delivery would cause huge environmental damage. The rods would allow the Iranians to obtain enough plutonium for many dozens of nuclear weapons, he said. The official also stepped up the pressure on Britain, France and Germany to take a tougher line on Iran, voicing the disdain within the Administration for the Europeans' attempt to defuse the Iranian nuclear threat through diplomacy. Britain had joined the effort in order to demonstrate its European credentials, he said. France and Germany had teamed up with Britain because they realised that the pair of them could no longer run Europe alone. Washington believes that the trio has been embarrassed by Iran's failure to hold good to a deal it struck with the Iranian regime last October. Iran pledged to give UN inspectors the freedom to make snap inspections, and also to suspend uranium enrichment. 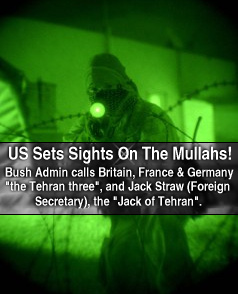 Since then, some members of the Administration have begun referring in private to Britain, France and Germany as 'the Tehran three', and to Jack Straw, the Foreign Secretary, as 'Jack of Tehran'. If the Europeans fail to get Iran to back down at a meeting this month, the US wants to close the gap between the rival diplomatic approaches and refer Iran to the United Nations Security Council. Russia is due to deliver the first shipment of nuclear fuel to Iran early next year for insertion into the reactor at Bushehr before the end of the year. Despite that, the official believes that it is not impossible to get Russia to see it our way and back a UN resolution that would 'raise the international saliency' of Iran's nuclear ambitions. He is convinced that Iran is afraid of a 'conveyor belt' that would lead inexorably to sanctions and even military action. Iran is one of the three members of President Bush's 'axis of evil' and has further angered Washington with its covert interference in Iraq since the end of last year's war to topple Saddam Hussein. The official dismissed suggestions that Washington would hesitate to seek regime change in Iran, given the problems it has encountered in Iraq, and Colin Powell, a restraining influence as Secretary of State, will not be serving a second term. It is less clear how the Administration could foment a revolution without uniting Iranians against 'the Great Satan'. The official claimed that more than its dislike of the mullahs, the Iranian population was dissatisfied with an economy that did not have jobs for the young: 60 per cent of the population is under 24. There is little organised opposition inside the country and financing it directly or through front organisations would probably play into the hands of the mullahs anyway. At present the US relies on about a dozen Farsi satellite television and radio channels in the San Fernando Valley, California. They beam pirate broadcasts to the estimated seven million Iranians with illegal satellite dishes. Last year Washington also set up a Persian-language Voice of America programme that is broacast into Iraq. The internet offers another channel for US propaganda, but efforts to impose stiff sanctions or fund anti-Government exile groups have been frustrated by a Republican split over the relative merits of confrontation or engagement. Despite the US threats one of Iran's top ruling clerics vowed yesterday that the Islamic republic would continue to pursue its controversial nuclear programme. "We are resolute. It is worth achieving it at any cost," Ayatollah Ahmad Jannati, head of the Guardians Council, said. July 21, 2004 -- 'LET the Palestinian street speak!" This was the threat launched by Yas ser Arafat at the end of the year 2000 when the final round of U.S.-sponsored peace talks with Israel hit the wall raised by the Palestinian leader. Waving a finger at Madeleine Albright, President Bill Clinton's secretary of state, Arafat forecast "an explosion of anger on the streets of Palestine." Almost four years later, this is what is happening in the Palestinian territories controlled by Arafat. But the anger of the "Palestinian street" is aimed at neither the United States nor Israel. The target is Arafat and the corrupt and cynical nomenklatura that make up his entourage. What is happening in Gaza and, to a growing extent, in the West Bank also is a genuine intifada aimed at bringing down yet another Arab tyranny. Unlike the two previous intifadas, however, this one has a genuinely popular base. It is not cooked up by some political machine backed by this or that outside power. Nor is it a wanton exercise in violence against civilians, whether Israeli or Palestinian. This new intifada has three important aims. The first is to reassert the power of the people against a leadership that consists largely of former exiles who had never really lived in Palestine. Arafat and his cohort were imported into the Palestinian territories by Shimon Peres, then Israel's foreign minister, as a means of forestalling the rise of a local Palestinian leadership. Many members of the Arafat entourage are wealthy businessmen with investments in the Persian Gulf, Europe and the United States. None has put a penny in Gaza or the West Bank. Although many of them were born in Palestine, the Arafat-led nomenklatura are, in fact, a colonial elite backed by different foreign powers over the past four decades. The second aim of the new intifada is to prevent the Islamists, notably Hamas and Islamic Jihad, from seizing control of the agenda at a time when Ariel Sharon's pledge to withdrawal from Gaza is perceived as sincere by most Palestinians. Both Hamas and Islamic Jihad had threatened to fight to prevent the Sharon plan from going ahead. In other words, what matters to them is not the return of any territory to the Palestinians but the dream of destroying Israel. The new intifada, however, represents people who wish to accelerate the Israeli withdrawal and are prepared to make Gaza work. The new intifada's third aim is to tell the outside world to stop aiding and abetting the confederacy of rogues created by Arafat. The message is especially directed at the European Union, which has been giving Arafat almost a billion euros each year to play with as he pleases. Arafat has used part of the money to buy support. Whenever faced with a critic, Arafat always asks: How much does he want? The outside world knows little of the extent of corruption that the Arafat regime has created. It is common knowledge in the Palestinian territories that a dozen or two influential individuals, many of them related to Arafat by blood or marriage, control the economies of Gaza and the West Bank. It is no surprise that one of the most popular slogans of this new intifada is a demand to end "looting and plundering" by Arafat and his cohort. The outside world is also oblivious to the reign of terror that Arafat and his clan have created. More Palestinians languish in Arafat's jails than they do in Israeli prisons. Journalists, lawyers, human rights activists and even parliamentarians are often beaten up or intimidated by thugs hired by the "Ra'is." Newspapers are censored and free radio stations shut down. Businesses suspected of siding with Arafat's opponents have their licenses revoked. Arafat has already destroyed three Cabinets, despite the fact that his men held a majority in all three. A fourth Cabinet, under Prime Minister Ahmed Qureia (Abu Ala) is also falling apart. Under such circumstances, the decent thing to do is for Arafat to step aside and allow the Palestinians to pick a new leadership that reflects the reality of their lives. But this is precisely what Arafat seems determined not to do. Arafat's refusal to see the writing on the wall is encouraged by the attitude of some Western powers that appear to have no clue as to what is really happening in Palestine. French Foreign Minister Michel Barnier travelled to Ramallah to pay tribute to Arafat as "the symbol of Palestinian nationhood" when "the Palestinian street" was calling for an end to his despotic rule. And the new Spanish government, anxious to cuddle Arab radicals of all colors, has voiced its "strong support" for Arafat's "leadership." The European Union, the United Nations and other members of the so-called international public opinion chorus, have also fanned the fires of Arafat's ego by pointing to his "historic role." Whether or not Arafat has any historic and/or symbolic value could always be debated. But what is at issue now is that Arafat is a tin-pot despot who has led his people into a political deadlock while his minions are robbing and torturing them. In any normal society, such a failure would not have the cheek to hang on to office for a day, let alone for years. The tragedy in all this is that the Palestinians are the best-educated of all the nations labeled as Arab. A much better Palestinian leadership could easily emerge from the current intifada provided the power that has been monopolized by Arafat is restored to the people. In all this, Sharon's decision to keep Arafat cantoned in his headquarters in Ramallah may have become counterproductive. At one point it was a good idea to force Arafat to stay in Palestine rather than travelling the world and playing truant in Paris (where he owns a luxury home). Now, however, Arafat is presenting himself as a mini-martyr because he is not allowed to venture out of Ramallah. The truth is that there is nowhere for Arafat to go to in the Palestinian territories. His last attempt at "bathing in a crowd" ended abruptly in Ramallah — where the hundred or so people who had gathered to see him started chanting "It is time to go, Yasser!" Maybe it's time for Sharon to lift the restrictions on Arafat and let the Palestinian people drive him out of power. There will be no peace in Palestine until there is democracy. And there will be no democracy as long as Arafat's despotic regime, financed by the European Union and backed by the "international community," excludes the Palestinians from the process of decision-making. One of the more intriguing aspects of last week's transfer of power in Iraq was the reaction it drew from neighboring governments in the region, particularly those that, traditionally, have been anything but democracy-friendly. Iran's mullahs, for instance, "welcomed" the transfer as giving "sovereignty back to the majority of the Iraqi people." Likewise, Jordanian government spokeswoman Asma Khader labeled the move "a step toward rebuilding political, economic, security and social institutions in Iraq," while Egyptian Foreign Minister Ahmed Maher called it "an opportunity for [the Iraqi people] to take control of their own affairs and restore complete sovereignty." Senior Syrian Information Ministry official Ahmad Haj Ali voiced similar concern for the welfare of the Iraqi people, telling al Jazeera, "There will be great security problems as a result of the U.S. presence and problems created by the Americans themselves." Judging by these comments, it seems that some of the same Arab and Muslim governments that for years largely ignored the atrocities committed under Saddam Hussein's regime have now become staunch advocates for democracy and human rights in Iraq. This is no accident, as the ruling elites in these countries are acutely aware that the U.S. drive to democratize the Middle East has brought the reform debate to the forefront in their own backyards. And like the new reality in Iraq, it is here to stay. Indeed, while most governments in the Middle East maintain that they will never accept reform dictated from outside sources -- particularly the United States -- widespread internal debate over the issue is already underway. Conferences on reform have been held this year alone in Morocco, Saudi Arabia, Yemen, Egypt, Jordan, Qatar and Tunisia, and media outlets throughout the region discuss the issue on a daily basis. Reform also has become an integral part of virtually every speech made in recent months by Arab leaders, including Syrian dictator Bashar al-Assad and members of the Saudi royal family. "People won't admit it, but three years ago reform was something few talked about," a Jordanian diplomat told Newsweek recently. "Today it's everywhere." Just last month, more than 100 Arab democracy advocates, political leaders and reformers participated in the Doha Conference on Democracy and Reform in Qatar. Its concluding declaration contained the strongest language seen thus far from an Arab or Muslim source concerning Mideast reform, asserting, "Democratic change has become a non-negotiable choice that cannot be postponed." Similarly, in May, several Arab foreign ministers met in Cairo to draw up a joint reform plan based on proposals from a number of countries, including Egypt, Jordan, Qatar, Tunisia and Yemen. The 22-member Arab League, however, has approached the reform issue much more warily. Given that pro-democracy movements are perhaps the most serious threat to the survival of the highly autocratic structure that exists throughout the Arab and Muslim worlds, it's no surprise that the league's members did not intend to put reform on the agenda of their latest summit. The conference -- which was originally scheduled for March -- ended up being postponed until May due to disagreement over the content of the U.S. Greater Middle East Initiative for democratic change in the region. In the end, though, despite several contentious moments, the Arab League ultimately adopted a 13-point program that represented the first joint pledge for reform in its history. While it has received a chilly reception from Arab leaders, the initiative has succeeded in spurring heightened competition from Europe in the area of democracy promotion. The European Union has increased funding for "The Barcelona Process," an outreach plan that was originally launched in 1995 and targets 12 Middle Eastern countries, including Egypt, Israel, Jordan, Lebanon, Syria, Turkey and the Palestinian Authority. The European Union recently allocated $6.6 billion to the program to help "establish a common Euro-Mediterranean area of peace and stability based on fundamental principles including respect for human rights, democracy, rule of law, the need for good relations between neighbors." Whether Middle Eastern governments will be willing partners in the EU plan remains to be seen. Still, although the recent talk of reform by Arab leaders may merely be cosmetic, it does offer an entry point for the promotion of genuine change in the region. The distinction between "imported" and "homegrown" reform is secondary to the fact that the discussion is finally on the table throughout the Middle East, creating a unique window of opportunity for the United States and its democratic allies to advance liberty in countries where freedom is forbidden. Nir Boms is a senior fellow at the Foundation for Defense of Democraciesandco-founderof www.pulseoffreedom.org. Erick Stakelbeck is senior writer for the Investigative Project.